Brief Summary: A scenic trip with variable weather and a strange mix of snow conditions, with nearly 8000 vertical feet of ascent and 7650 vft of continuous ski descent from Shasta's summit all the way to the Clear Creek Trailhead (the most I've ever done without taking my skis off). The Clear Creek route itself and adjacent Wintun Ridge have little snowcover left on their upper portions, but a continuous ski line from the summit could still be found by crossing below the Watkins Glacier onto the Wintun Glacier, and then following it directly up the east side of the summit block. 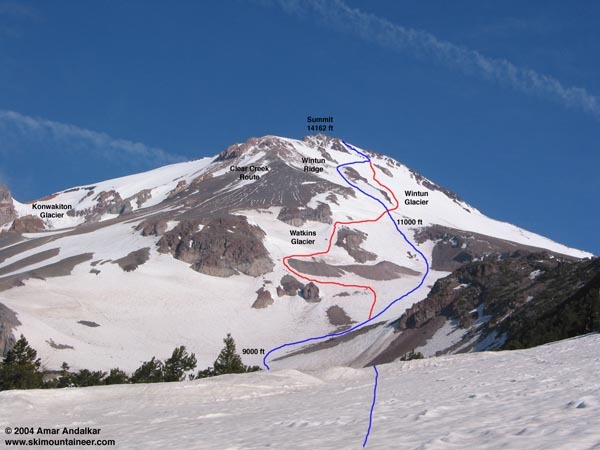 Having skied twice from Shasta's summit already this spring (via Avalanche Gulch / Red Banks in April and Hotlum-Bolam in May), what could motivate me to make yet another trip all the way down there? Well, back in May I hadn't managed to also ski the Clear Creek route as planned, so that had remained on my agenda. Generally cool and cloudy weather during May with several snowfalls had kept the snowpack in good shape on Shasta. So with a forecast for a clearing trend and sunny high pressure, I drove from Seattle to Shasta on Thursday, June 10, getting a late start and not reaching the trailhead until nearly midnight. The road was still blocked by snow at 6250 ft, about a half-mile before the trailhead. I headed up the mostly snowfree road just after 6 am, then followed the mostly bare Clear Creek Trail until solid continuous snow was reached above 7000 ft. I skinned up the hard-frozen snow along the ridge, formed into a very interesting roller coaster by wind deposition for nearly 1000 vertical ft, and then traversed into the bowl of the Clear Creek drainage at 8200 ft. An obvious continuous skiable line was visible, going up and right passing beneath the Watkins Glacier and then nearly straight towards the summit by angling right up the Wintun Glacier. I skinned until 10600 ft where the slope steepened just NE of the Watkins, and then cramponed up on foot the rest of the way. Lots of new snow from earlier in the week could be found above 11000 ft, most of it was starting to consolidate but numerous sections were still packed powder. Near 12000 ft, the puffy clouds that had been building all day just east of the mountain rose up to envelop me in a whiteout. I waited it out for 20 minutes on a rock rib along Wintun Ridge, unsure whether to continue or turn back, but then the sun slowly broke through. The sky overhead would remain sunny the rest of the way to the summit, but the clouds sticking to the east side of the mountain would not fully clear until evening. I angled up and right to join the upper part of the Hotlum-Wintun route at about 13000 ft on the Wintun Glacier, meeting another skier coming up that route who turned out to be Wolf (wolfs) from TAY. I reached the 14162 ft summit around 2:30pm, with light winds and warm temperatures near 30 F.
I relaxed a bit, chatting with the few others at the summit (the first time this year I hadn't been completely alone atop Shasta) and waited for Wolf to finish climbing the last bit. We skied down at 3:30pm from the north side of the summit block at 14150 ft, on firm but edgeable snow, with occasional sections of nastier crust and also much nicer snow. I angled SE near 13000 ft while Wolf continued east down the fall line. Skiing across and down the Wintun Glacier, the weird mix of snow conditions continued, with everything from fresh wind-packed powder to crust and even a few nice long stretches of corn-like snow. The suncups became larger as I neared the south edge of the Wintun Glacier, with areas near 11000 ft along Wintun Ridge reaching 1-2 ft high, but still soft enough to be skiable. Just for fun and to ski another of Shasta's glaciers, I decided to cut right via a steep slope to reach the small Watkins Glacier, which occupies a cirque with prominent moraines at the head of Clear Creek. The best and worst skiing of the day was found on the Watkins, with a 35-degree SE pitch of perfect corn for several hundred feet followed by a traverse across a 45-50 degree slope with firm 3-4 ft high sharkfin suncups. Really outlandish, skiable only by traversing, but not very scary because a fall would have had no bad consequences (a flat area was only 50-100 ft below). Below the horrible suncup traverse I skied out through the gap in the terminal moraine of the Watkins and then weaved through the rock studded slopes below into the nicer ground of the Clear Creek bowl. The rest of the ski out was on fairly nice well-consolidated snow, sticky but never mushy even by 5pm. The roller coaster ridge was fun, and by angling to skier's left (away from the trail) it was possible to find continuous snow well below 7000 ft. I skied through the woods, crossing a few logs and patches of bare ground, aiming straight towards where I expected the Clear Creek trailhead to be. I was quite surprised to pop out of the woods onto the road right beside the trailhead at 5:30pm, having skied continuously from the summit. Numerous reports the previous week from both the USFS and the Fifth Season had said that the skiing from Clear Creek was terrible and was done for the year, but if 7650 vertical ft is "done", I'll take that anytime! I figured that even if the standard Clear Creek and Wintun Ridge routes were getting bare, the variation with a crossing onto the Wintun Glacier would still be good, and it was. I'm glad I chose to ignore the reports this time, and it turned out to be a spectacular trip. This photo shows the southeast side of Shasta from the Clear Creek trail. The upper part of the ascent route is shown in blue, with the ski descent shown in red where it differs from the climbing route. Click here for an enlarged version of this photo.